Down Thru The Years is a celebrated deep soul item and well deserves it’s place here. The track is a dead slow item full of gospel influences from the churchy organ to Horace’s world weary vocals. Producer Mattie Moultrie - who released at least one religious 45 on the same label - also had her own killer deep soul items “That’s How Strong My Love Is” and “The Saddest Story Ever Told”. I’ll bet that she is one of the background singers here. The R & B flip has some admirers on the dance scene. UPDATE ~John Soul Smith has kindly written with some new info on Horace saying that the page "looks a bit empty" (how right he is!) and adding:- "I'm unsure if the following info relates to the same guy but guess that it does. In 1945 there was a singing MC at a club (the Ubangi; 2213 Pennsylvania Ave) in Baltimore. He seemed to become quite a popular singer in the city in the late 1940's. Then in 1951, Coral Records made quite a big fuss over a new singer they had just signed up; Horace Bailey. A single (“Wish You Were Waiting For Me”) escaped in November and two more followed in 1952 but none (to my knowledge) enjoyed any chart success. His sides for Coral were cut in conjunction with Lou Stein's Orchestra, an outfit with close ties to Old Town Records, so I'd think they were New York based. Things then go quiet for a while until around 1957, Horace reappears on the Baltimore club scene. He played gigs at the Club Casino (again on Penn Ave - the heart of the city's entertainment scene) with Apollo recording artist Cornell Drew (his current 45 was "Everybody's Trying To Steal My Girl"). 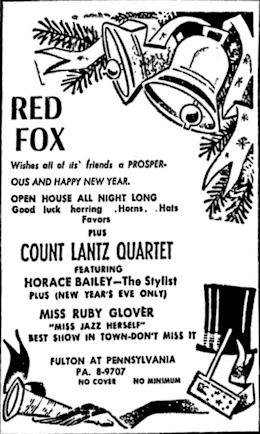 He was still around Baltimore at Xmas 1960 performing at the Red Fox (jazz) club with the Count Lantz Quartet & their then featured singer Ruby Glover. (In 1959, the Count Lantz Quartet's featured singer had been Irma Curry before they started to back up top local jazz singer Ethel Ennis). 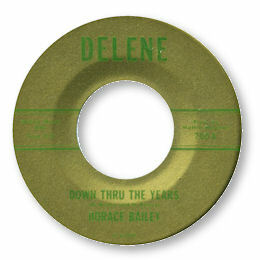 Horace then disappears again until his mid 1960's 45, cut in conjunction with Mattie Moultrie. Baltimore had no decent recording studios until the end of the 1960's, so I guess an artist from there would have headed out to New York (or DC, Philly) to land a record deal in the 1950's / early to mid 60's). So it seems likely to me that a guy from Baltimore who wanted to record could easily have ended up signing with New York based Coral Records." I'm very grateful to John for taking the time/effort to send this excellent info - and also the smashing club poster. The only thing that remains is for confirmation that this indeed the same guy as the artist on Delene. Anybody?